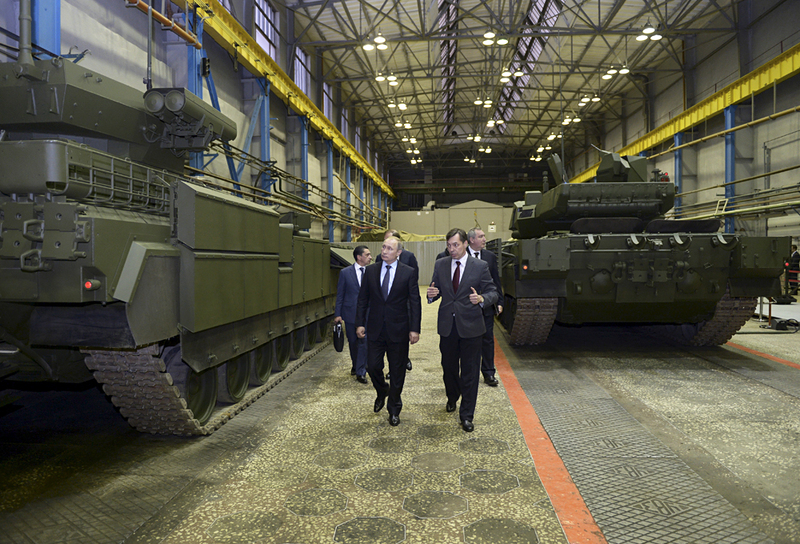 Russian President Vladimir Putin (L) listens to Andrei Terlikov, the head of the Ural Transport Machine Building Design Bureau, as they watch Russian infantry fighting vehicle with the Armata Universal Combat Platform and a T-14 Armata main battle tank at he Uralvagonzavod factory in the Urals city of Nizhny Tagil, Russia November 25, 2015. German military concern Rheinmetall Defence has unveiled a model of a gun developed especially to engage in combat with Russia’s new T-14 Armata and T-90 tanks. At the Eurosatory-2016 Defence & Security International Exhibition, Rheinmetall Defence, the German military concern, presented a model of a gun that has been developed especially for destroying the new Russian T-14 Armata and T-90 tanks. The 130-mm gun will be fitted to a new tank that Germany and France are currently developing as a substitute for the Leopard 2 and Leclerc battle tanks, writes Defense Update. "The first technical demonstration of the gun took place in May 2016 and after its presentation at Eurosatory it will be tested at the Rheinmettal firing range," says the IHS Jane's 360 website. The German company is currently busy constructing the special armor-piercing projectile for this weapon (it features a perfected launching system and an elongated tungsten core). However, Russian experts believe that it is practically impossible to evaluate the gun's real possibilities until testing of the projectile has been carried out. Germany began considering upgrading its famous Leopard 2 tank to a next generation after Russia presented its Armata combat platform and the T-14 tank based on it. Now, with the T-14s entering the Russian army, France and Germany are conducting bilateral talks not only on developing new generation artillery but also on a planned replacement for their Leopard and Leclerc heavy tanks that can match the Armata's combat potential. Could you fly an Alligator Ka-52 helicopter and drive a T-90 tank? Earlier, military experts noted that the German Leopard-2 tanks, which are considered among the best in the world, do not have projectiles capable of piercing the armor of the Russian T-80, T-90 and T-14 Armata tanks, reports the U.S. international affairs magazine The National Interest. However, Germany is actively working to solve this problem by either adapting American-produced projectiles to its tanks or developing its own depleted uranium ammunition, writes The National Interest. Although Rheinmetall Defence is presenting the new weapon as a resource for fighting Russian Armata-platform tanks, it is still unknown how effective such a gun will be against the new Russian technology. "The new German 130-mm tank weapon is still being developed and it is unclear whether it will be capable of piecing the armor of Russia's leading tanks," said Igor Korotchenko, editor-in-chief of National Defense magazine. Korotchenko stressed that since the gun's projectile has not yet been made, statements about its superiority to Russian tanks are nothing but the producer's attempt to advertise his product. One RBTH source said that defense industry experts have still not pronounced their final verdict on the new German weapon: "At the moment our delegation is familiarizing itself with the matter," noted the source. In April 2016 the Russian Defense Ministry signed a contract to buy 100 Armata-platform tanks. According to Deputy General Director of Uralvagonzavod Vyacheslav Khalitov, Russia's armed forces will receive the first series consisting of 100 T-14 tanks in 2017-2018.